What we ARE suggesting, is that you look in unlikely places for great coupons! 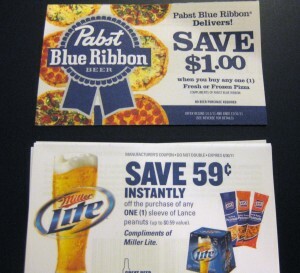 You may not think that some of the best coupons can be found between the Old Milwaukee and Budweiser…. but you’d be wrong! The beer aisle is one of the first places I head to in the grocery/drugstores/gas stations to check for tearpads. While most of them are rebates for buying beer (or a beer + food combo) – there are often regular coupons that say specifically “No Beer Purchase Required”. My favorite “beerpad” of the year so far is the Pabst Blue Ribbon tearpad. It is good for $1 off ANY fresh or frozen pizza priced at $1.99 or more. That can make for GREAT deals during a BOGO sale, or paired with deals like the Bi-Lo pizza meal deals we see so often. Another tearpad I just found this week was at a gas station down the road. It is good for $.59 off Lance Peanuts (Which are exactly $.59) And although Miller is depicted all over the coupon – it simply says “Compliments of Miller Lite”. That means FREE PEANUTS! I hope you start taking a closer look at the “Beerpads” in your neck of the woods! Super-Cool Fact: Most beer rebates require you to purchase a certain amount of alcohol in addition to meat, soda, snacks, etc… However, in some lucky states (AL, AR, CT, HI, KY, ME, MD, MO, NC, NJ, NY, OK, UT (yeah! that’s where Deidre is!) 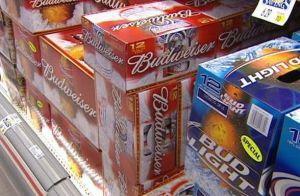 and WV) you are not required to purchase beer in order to get the rebate. The law prohibits it. Which means, you can buy the item – and NOT the alcohol – and get money back! Purchase Heineken 12-Pack + $7 worth of Deli Meat – Get a $5 Rebate. = Super cheap deli meat for you! Let us know if you find any good ones in your beer aisle!